… the more it remains the same. At a meeting in Ontario, CA, today of the Association of Ground Water Agencies, the speculator Cadiz, Inc will present a privately-commissioned study showing that the Mojave aquifer it proposes to pump can yield 50,000 acre feet of water a year, or enough for 400,000 people. Business Week* and the Cadiz website have the stories, which in the case of Cadiz’s version is just that — a story. Environmental reviews carried out ten years ago by the Department of Interior, and now available through the Pacific Institute, reveal what US Geological Survey hydrogeologists called “gross exaggeration” by Cadiz of the amount of water available. Their estimates of the sustainable yield, which were roughly 15 times lower than Cadiz’s, may be found in Volume II of the federal review. But since signing on as Cadiz chief counsel last year, Southern California water lawyer Scott Slater has argued that those reviews no longer apply. Everything about the project is new, he told Larry Mantle on KPCC’s “Air Talk” last September. It’s now a “conservation” project, he said. The odd thing is, it turns out from today’s new release about the new study for the new conservation project, the amount of water they hope to mine from the desert is exactly the same as found grossly excessive by the original environmental impact review. 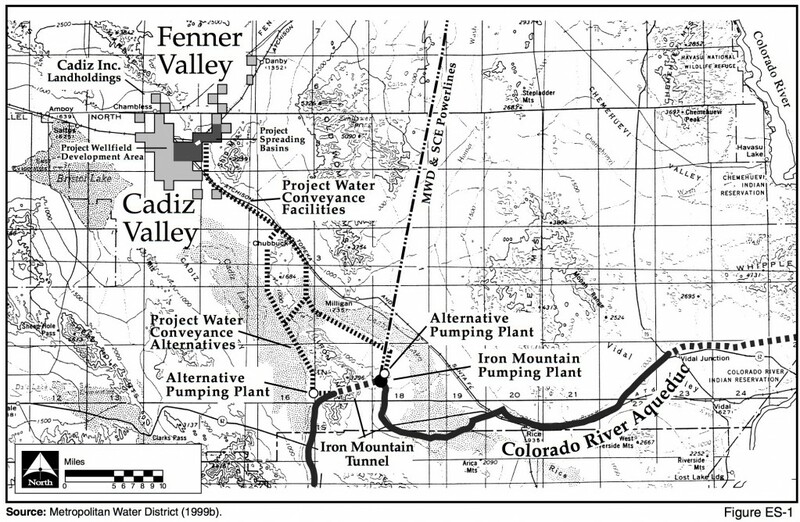 The new Cadiz release claims that the new environmental review needed to realize this new project may be finished by the end of the year. Hold on for the fact checkers on this. The last time Cadiz told its shareholders that the studies were underway, California regulators had no record of their having even begun. To see that earlier claim, among many, exhaustively checked, click here. Finally, to those of you looking to get in on the ground floor of a sure thing, before you phone your broker, have a look at what happened last time Cadiz mounted a publicity drive claiming it had new water in a drought.